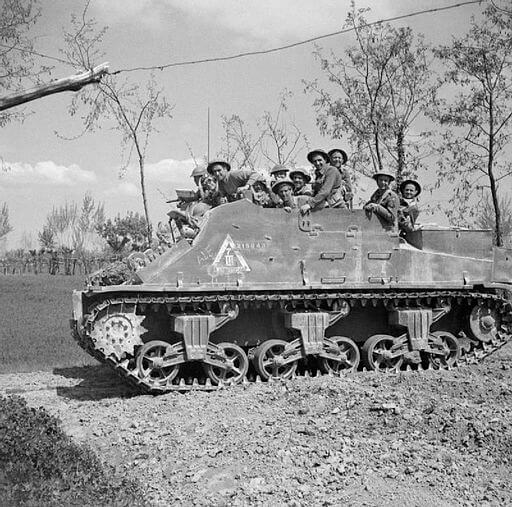 The Kangaroo was an early armoured personnel carrier, created by simply removing the turret from a tank or (as in the photograph above), by removing the main armament from a self-propelled gun. 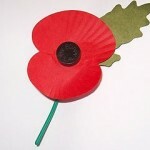 It was devised by the Canadians as a way to reduce infantry losses. The first examples were based on M7 Priest self-propelled guns, converted at a field workshop code-named Kangaroo (which is where the name came from). As well as removing the main armament, the Priests had their front aperture covered over. Most Kangaroos were based on Priests (these examples were sometimes referred to as “defrocked Priests”) and Canadian Ram tanks, although Sherman and Churchill tanks were also used. All variants were known as Kangaroos, with the base vehicle name as a prefix (Sherman Kangaroo, Ram Kangaroo, Churchill Kangaroo, etc). Despite being created as a simple and quick solution to a problem, the Kangaroo was a great success, and many more conversions were carried out. The success of the Kangaroo led directly to post-war APCs such as the American M113, British FV432, and Soviet BTR-50.